Baiheliang Ancient Hydrological Inscription is part of the Tentative list of China in order to qualify for inclusion in the World Heritage List. White Crane Ridge calls itself the First Hydrological Station in the world. It served as gauged for measuring low flow years at the river by placing a statue of a fish (or that one single crane it is apparently named after). It is of cultural value. The best and probably only place to see the stones are that the Baiheliang Underwater Museum in Fuling town, directly at the river. Fuling is a short train ride away from Chongqing which makes this quite convenient to visit. The taxi driver from the station to the hotel says a lot of people come here just for the museum, and indeed the morning already had a lot of people waiting outside but I think most were from one big bus tour. The museum is visited by only via tour only in Chinese, only has Chinese panel. 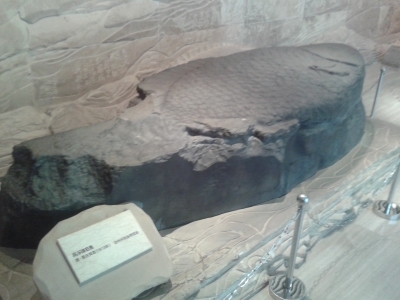 The start of the museum has a big rock replicate of one of the fish stones below the water (see picture). After a short tour of the floor you can descend an escalator (which only gets switched on when a tour is coming so you cannot go ahead plus a guard will stop you) below the river. On a good day you can actually see the rocks below. Unforunately with pollution rampaging the rivers in China there were no visible rocks when I visited. Everyone basically just walked by the port holes or just took selfies with murky water. The escalator takes you back up and the tour is done. A little disappointing but I see the unique value here and I suppose my expectations weren't that high either.